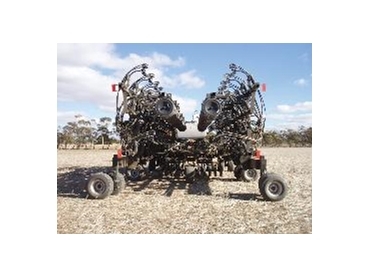 Flexi-Coil’s new 5500 Air Drill performed exceptionally well in recent trials across Western Australia and South Australia, with farmers commenting on its unique design and ability to consistently control seeding depth in a variety of soil types. Available in 18.3 and 21.3 m widths, the Flexi-Coil 5500 Air Drill features a patented two-piece wing, with simple, parallel-circuit hydraulics. This design minimises stress on the framework while ensuring depth accuracy. The 5500 Air Drill achieves exact and repeatable sowing depth via a unique configuration that features two front ranks which follow the contours of the land at a depth set by the nearby caster assemblies and a further two rear ranks that follow the ground on which the press wheels run. Single-point depth setting provides simple control of the depth across the entire machine. “It’s a really good, one pass machine which would save quite a bit of time in a busy season,” Sam added. The Flexi-Coil 5500 Air Drill also met with a warm reception at a property 60 km east of Dowerin in Western Australia. Peter Crippen, Farm Sales and Product Support Manager at Flexi-Coil dealer, Boekeman Machinery, said around 35 farmers turned up to see the machine in action on a 30 hectare site sowing barley. “The two-piece wing design is quite different from what most operators have seen before, so many of them wanted to see it fold and unfold,” Peter said. “It folds down to just 5.3 metres making it exceptionally easy to transport. At this folded width, the bar is only about 200mm wider each side than the Steiger 530Hp Tiger we had pulling it,” Peter exclaimed. According to Peter, some other noted features of the Air Drill were its tough, heavy-duty main frame, ability to follow the contours of the ground with its independent gang style design, simple road to field operation and its compact design for road transport and storage. “The end result is an ability to perform a complex job, while being easy to operate,” he said. Along with the unique design and configurations, transport is also safe, faster and less stressful. To deliver a smoother ride, all tyres work in transport and operators can choose from a single-bar heavy harrow or disc leveler to customise soil closing options.